It’s magical when the light, the photographer and nature all align in that decisive moment. 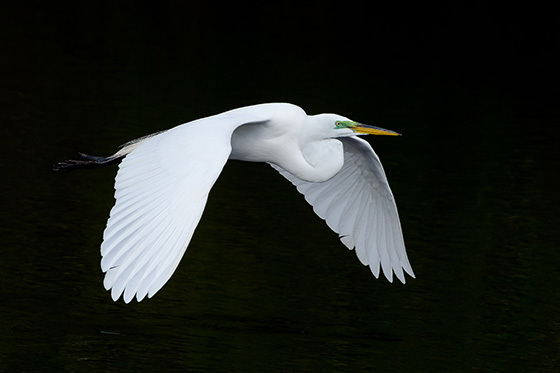 I’m truly blessed to capture this majestic great egret in breeding plumage in flight. Hunted nearly to extinction by the late 19th century, today it is the symbol of the National Audubon Society. For native Miamian and Fort Lauderdale photographer Phoenix, preserving wilderness is not a necessity, it is an essential for the human spirit. More than a scientific necessity for creating air, clean water and producing food, preserving nature is a sacred necessity for healing and bringing peace to the human soul. As an artist, it is her hope that the visions she captures of magnificent places and amazing animals will inspire others to love and protect the environment for generations to come. She has created a recognizable body of original works of the highest artistic quality, been accepted in numerous juried exhibitions, had eight solo exhibitions, garnered awards and private sales and developed a greeting card line. Phoenix considers it a sacred privilege to reveal the extraordinary wonder and beauty of south Florida, particularly its wetlands. Her work captures the beauty of our natural environment while revealing our unique and fragile ecosystem.